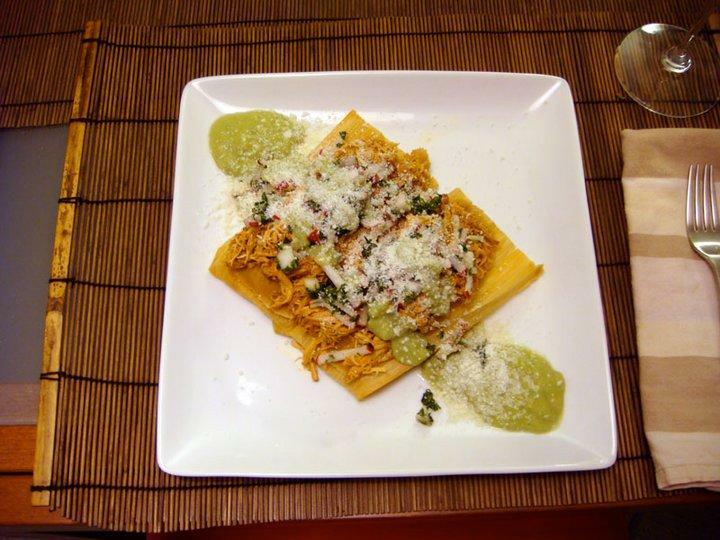 Chicken Tamales with Tomatillo Sauce – Top Chef Night | Eat.Drink.Life.Love. Chef Tiffany Derry started out solidly in the middle and is quickly moving towards the top. We positively drooled over this chicken tamale recipe and K was 100 percent on board with her philosophy that tamales should contain more meat. K really took one for the team on this recipe. He started the chicken and spices in his crock pot before he went to work and when I got to his place it smelled heavenly! He’d also already made the masa dough — lard and all. While he started stuffing the dried corn husks, I started chopping veggies for the radish pico de gallo and the tomatillo sauce. Instead of the habanero pepper we went with jalapeno because … well, because I like my taste buds and don’t want them burned off. Once everything was chopped and the tomatillo sauce was made, we steamed the masa-stuffed corn husks and took the chicken out of the cooking liquid. With the tamales steamed and the chicken pulled apart (actually, it was so tender it fell apart on its own) K assembled the plates. I love a good tamale. I would hang out at Midtown Global Market all day just so I could eat tamales for breakfast, lunch and dinner. Also a snack. And dessert. These were most definitely good tamales. The chicken was nicely spicy and supple and the masa springy and moist. The radish pico de gallo was crisp and fresh and the tomatillo sauce smooth and tangy. Add a nicely bubbly vino verde and you’ve made a serious run for the border.